After surviving a disastrous battle at prom, Alyssa has embraced her madness and gained perspective. She’s determined to rescue her two worlds and the people and netherlings she loves. Even if it means challenging Queen Red to a final battle of wills and wiles... And even if the only way to Wonderland, now that the rabbit hole is closed, is through the looking glass world, a parallel dimension filled with mutated and sadistic netherling outcasts. Time is running out for Alyssa to not only save her mother Wonderland, but her beloved Jeb and Morpheus who are trapped behind the looking glass. Having destroyed the only way in, Alyssa enlists the help of her father who is still coming to terms with his daughter being a a halfling and belonging to the mythical Wonderland that destroyed her mother's sanity. The Red Queen is now in possession of the Queen of Hearts body, and has unleashed a terrible fate upon the fantastical landscape. Wonderland is dying and has been temporarily saved by the Ivory Queen, who has cast a spell to freeze the decaying process. Wonderland residents are roaming free and blame Alyssa for the destruction of their home. Entering Anyelsewhere, at least one of her loves still has faith in her, with the volatile Jeb turning his back on their relationship after seeing Alyssa and Morpheus sharing a passionate embrace. But where the surrounds mute magic from being used, Jeb embodies the power of the Red Queen, his paintings being brought to life, literally. To survive, Morpheus and Jeb have needed to work together, putting aside their differences and the quest to win Alyssa's heart. The Red Queen wants to take back her crown and rule Wonderland once more, but only by inhabiting Alyssa and vowing to heal the magical landscape once more. But as Alyssa is torn between her love for Wonderland and her mortal realm, she will need to choose. Wonderland and Morpheus, leaving her family behind. Or Jeb, leading Wonderland to a fate worse then death. 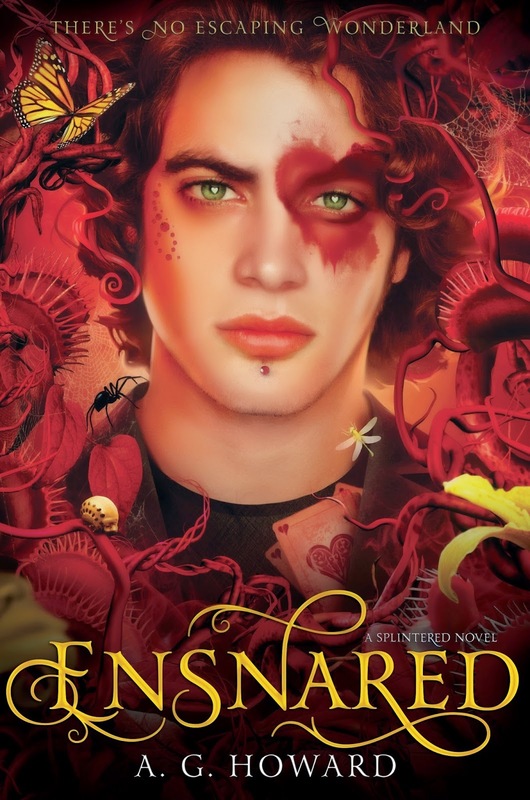 Ensnared has been one of my most anticipated releases. Even though I have a paperback on it's way, I couldn't wait and also bought a copy on Kindle as well. Unhinged left readers on tenterhooks, with Alyssa's ultimate choice between her Mortal Knight in Jeb, or the fabulously manipulative Morpheus. Each guys occupies a different side of my dual heart. Together, they bridge my netherling and human worlds. But before Alyssa can make a decision, she has a wonderland to save. Yet again, the world building is phenomenal. The morbidly fascinating creatures that have now been driven from their homes blame Alyssa, and rightly so. She halfheartedly invested in their world, then left them all to deal with the consequences of a Queen gone mad. But the underlying storyline still remains her decision on which suitor she will choose. I was enthralled from the opening chapters, revisiting the world of Splintered with the verge of Wonderland being all but destroyed. The royal politics at play, the deception and manipulation were delicious. Alyssa is forced to become the heroine, or risk the lives of her family and the two men in her life. Her wicked streak was enchanting, on the verge of becoming the cruel tyrant Red Queen once was, while trying to hold onto her own humanity. So where did Ensnared begin to fall apart? The romance. It completely engulfed the second half of the storyline. Now kids, this is where I'm kicking off with the complaints. The romance was strung along throughout the storyline, Alyssa's inner thoughts and soapbox speeches teasing readers, while teasing both Morpheus and her Mortal Knight as she fluttered between the two. She would be pinning over Jeb, who was still angry at her deception, while allowing Morpheus to flirt and she willingly accepted his advances. It was irritating. It turned the suspense and intensity into a mockery. I don't usually buy into love triangles, and rarely ever support one side over the other, but Morpheus left me no choice. He's manipulative, deceptive and incredibly dreamy. He's made of imagination and I was adamant that I'd be flipping tables and readying myself with a fork if I didn't get my way. But did I enjoy the ending? The short answer is yes. The in depth answer is that I thought the ending was softened to please all fans. No difficult decisions were made. A conclusion was reached, but it felt more so that the author couldn't commit to taking the plunge and we end up back at the same dilemma of Alyssa having the best of both worlds. Readers will see it coming. But overall it's a worthy series finale, although may hint at further installments in the series. We can only hope. I didn't mind it in the first two as much, the flitting between Morpheus and Jeb annoyed me in this one. And that ending pissed me off unfortunately. I expected more. Will you eventually read the entire book? Ugh. I'm so glad I decided to sever my relationship with this series. I have had enough of love triangle dramas to last me a lifetime. Lol. And it's a real shame too Joy, because the imaginative world building in the series is phenomenal. I still love it overall, regardless of how the series concluded. The love triangle in this one is okay though if you know how it works out. I hated that Jeb was as angry as he was the whole time, but then I felt it was explained well, and I won't say it so I don't post a spoiler. I loved the book, all the way through. It all worked for me. Sorry it wasn't as great for you. He certainly had his cranky pants on, that's for sure. I just needed a definite conclusion. I was so invested in this series that I think I might have got lost in all the hype of the finale. I still really enjoyed it though. I hadn't given the first two books in the series a try for some reason (although I've had them on my TBR for a while) but that whole pesky love triangle angle your talking about has me really glad I didn't pick up the first two books. I'm done with love triangles. Hopefully your next read has a super KILLER romance that makes you swoon and feel ALL THE THINGS because you deserve that! Great review! Aww, thanks Lily. I hope so too. The series is worth it alone for the world building and fans of dark retellings. It was just my own preference that the romance in this one didn't work for me unfortunately. I just scanned the review as I haven't read any of this series. I am curious though. I'm sorry the romance kind of fell apart for you in this one though. But it's worth it for the world building alone Lauren. The dark side of Wonderland was truly delicious! I read your spoiler (I know! I'm so bad!) and I can completely see where you're coming from. The decision that Howard made about the choosing of love interests just sounds like it would make you feel just a bit cheated almost. :| Nonetheless, glad you enjoyed it regardless as I know how much you love this series! Thanks for sharing Kelly! I honestly DID feel cheated Zoe. Overall I enjoyed it, but I felt it was the easy way out sadly. Don't click whatever you do! I didn't want to spoil it for anyone. Ooh, I'm really looking forward to seeing your thoughts on how it all wrapped up. By half way I thought I had it pretty much all figured out and was hounding Kristy from Book Nerd Reviews about my theories, since she'd already finished it. I would love to read this trilogy because fairytale retellings are the best, especially if they retell Alice in Wonderland. Also, books with stellar world building are so immersive, and really bring readers into the story. Too bad the romance threw it off. I generally don't like when romance takes too much of the focus in a book, and soapbox speeches are the worst. I am afraid I have written many soapbox speeches in my WIP. Oh well. At least I can still edit. Alice in Wonderland is my favourite read of all time. Every few months when I find myself in a bit of a reading slump, a break out a copy and all is well in the world again. The romance was a let down, but the rest was absolutely brilliant. Definitely get a hold of this series Ana, you won't be disappointed. I'm so pleased this was a worthy finale! So many series lose that magic on the last book, so I'm really happy Howard kept the spark alive in this one! I haven't read the series (YET) but retellings are my favourite thing since sliced bread, so I know I'll be getting around to this sometime in 2015! Sooner rather than later Allie. The dark world building is absolutely delicious. Can't wait to see if you'll champion Morpheus or Jeb. Go with Morpheus, just quietly. He's delectable. GAH I AM SO TEMPTED TO READ YOUR SPOILERS. I loved Splintered but hated Unhinged so I'm going to read this one with very low expecations--especially after seeing so many people disappointed with the ending. I can't wait to see what you think of it poppet. I have an inkling that you may engage in a little book rage before the last page is turned. Read it soon, I'm dying to read your thoughts. OH MY GOD. YOU ONLY GAVE IT 3 STARS??? I CANNOT.